It’s also known as ambient light, and includes daylight from windows, doors, and skylights. But when it’s overcast, or dark, we have to use artificial light for these purposes. So many people — even professional designers — fall into the trap of making “Swiss cheese” out of ceilings with too many recessed fixtures. 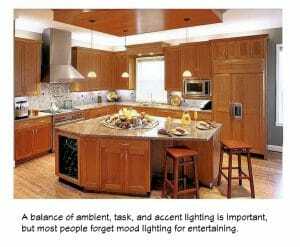 General kitchen lighting often provides a safe pathway, starting at doors. It can include indirect ceiling or soffit lighting, using new LED strip light technology. This lighting includes under-cabinet fixtures and ceiling-mounted fixtures over countertops, to assure safe working conditions. They didn’t provide continuous lighting on the countertop surface; there would be shadows between each fixture. There was a reflected glare on the countertop, especially highly-polished and dark-colored stone. Halogen lights get hot, heating up the inside of wall cabinets, and creating a burn hazard for your hands. They weren’t easily dimmed, either on or off. LED fixtures don’t have any of these problems! Because they’re thin strips, they can be mounted on the inside lip (or small trim) of all wall cabinets! Continuous light, no glare, no heat, and they can be dimmable! Ceiling-mount task lighting: This includes recessed fixtures and pendant fixtures over islands, peninsulas, and tables. “Puck” lights in display cabinets. Recessed fixtures with special trims: Angle-cut adjustable, slot aperture, gimbal, retractable, and framing projector. Picture lights attached to the back of a picture frame. To achieve the best kitchen lighting results, each type (or group) of fixtures should be controlled by a separate switch for maximum flexibility. Often, there are space limitations at doorways that prevent more than three switches ganged side-by-side. It can get very confusing if you have more than four switches lined up, either horizontally or vertically. If your kitchen lighting budget permits, you can have a one-room lighting system installed, where all of your lights are controlled by buttons in the same space as a single switch. The wonderful thing about these types of controls is that you can set different scenes, i.e., one for preparing meals and cleanup, one for dining, and another for entertaining a large group of people. I’m a fan of Lutron switching, and have had great results with their systems over the years.There are several other manufacturers, including Cooper, LeGrand, and Leviton. With available technology, why install just switches and not dimmer switches? A standard toggle or paddle switch is less expensive and easiest to wire, but there’s no comparison between all on/all off option versus dimming the lights to the exact level where you want them. It’s especially important to have dimmer lights when you’re entertaining. It sets the mood for a special occasion. All clients have expressed gratitude for the recommendation to substitude dimmers for standard switches. There was one couple in particular that I’ll never forget. The husband was adamantly opposed to dimmers because of the increased investment, but his wife and I ganged up on him. When their whole-house remodeling project was finished, you’d think all they did was “switch” to dimmers! Lighting can make or break any environment. You can have a modest kitchen, but if it’s got great layered lighting, you and your family, and guests, will enjoy it totally. See the before and after photos plus a detailed description of the featured project. Read about Diane Plesset’s experience, philosophy, and training.